Our Conan birthday party is tonight so I'm busy tidying house and getting things ready. I'm a little too busy for a full ConeZone post today, so here's a cute Conan pic instead. I used this for the FB party invite. 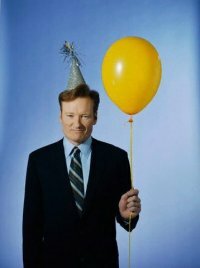 Also, if you weren't already in the know, you can get the inside scoop on what's going down with Conan's tour by checking out the Teamcoco. com Blog, updated by Aaron Bleyaert. All sorts of little tidbits you can learn about the tour experiences they're having. Have a great weekend and I'll fill you in on our Conan party next week! Have fun at the party tonight! I'm jealous! we were sad that we missed it. u gonna post all of the crazy shenanigans?? ?